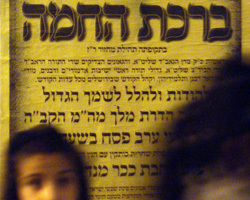 Pashkevils - admonitory posters - announcing Birkat Hachama prayers in the Jerusalem's ultra-Orthodox neighborhood of Mea Shearim. Prof. Ariel Cohen: "The tradition contradicts every astronomical principle today, and even the Hebrew calendar, as it is now used"
Hundreds of thousands of Jews around the world will awake before dawn on Wednesday, climb to high vantage points and wait for the sun as they recite a prayer said only once every 28 years. For many of the participants, this will be their first time reciting the "Birkat Hachama" prayer, which according to Jewish tradition, marks the sun's return to its starting point at the moment the universe was created, after completing a 28-year cycle known as the "machzor gadol," or "large cycle." The last prayer was held in April 1981. At the time, Haaretz correspondent Akiva Eldar described throngs of Jerusalemites ascending to the Western Wall Plaza 3 A.M. to recite the prayer. This year, however, the blessing has added significance, as it falls on Passover Eve, a sign some observant Jews interpret as a potential harbinger of a redemptive event of cosmic proportions. Yeshivas in the capital are holding special sessions to interpret the significance of the event. At the Kahal Hasidim yeshiva, posters promise "a comprehensive lesson accompanied by an enormous model of the zodiac and constellations, according to the renowned expert on the stars' positions and heavenly bodies, Rabbi Mordechai Ganot, may he live long." Ganot and other speakers fill auditoriums. He said "many questions remain" over "the thesis of a certain Polish priest named Copernicus," but emphasized, "Anyone who believes in the new system is not considered a heretic." According to the Babylonian Talmud, the Sun was created on the fourth day of creation. Because Jewish law considers a day to span from evening to evening, the beginning of the halachic fourth day occurs at sundown Tuesday evening. The 28-year-cycle therefore begins and ends at the exact point in time when the sun was created, and the sun only returns to this position once every 28 years. Does this tradition receive any support from modern astronomical knowledge? Prof. Ariel Cohen of the Hebrew University's Department of Atmospheric Sciences said, "If the length of the year was as they thought it was 2,000 years ago - that is, 365 and a quarter days - then 28 years would indeed be an accurate cycle. But based on knowledge of the year's length gained in the past few hundred years, 'Birkat Hachama' is an embarrassing tradition, testifying to a complete, blatant and intentional disconnect from modern science." Cohen also took issue with the Scriptural decree to recite the prayer at the beginning of spring, saying that because the calendar in use today is vastly different from the one used in the past, the "tradition contradicts every astronomical principle today, and even the Hebrew calendar, as it is now used." Gaza doctor whose three daughters were killed during Gaza op gets Nobel nomination. Obama: U.S. 'strongly supports' two-state solution, vows to continue peace process. 18. Prof. Ariel Cohen is an embarrassment with his ignorance. Prof. Ariel Cohen is an embarrassment with his ignorance. 19. You cynics out there think you`re SO superior! You cynics out there think you`re SO superior! 25. To Observer #24. It is a good feeling to disregard reality. To Observer #24. It is a good feeling to disregard reality. 27. Seems to me that . . . Seems to me that . . .
Quality cosmetics from the Dead Sea. Coupon code HAARETZ for 12% off!